Mysuru: The controversy over the treatment meted out to women and girls by unruly elements at the Open Street Festival on Oct.13 refuses to die down as more and more women have taken to the social media to express their anguish and anger at the arrangements made by the authorities concerned. SOM Office was flooded with calls and emails yesterday from many women and girls over the outrage and molestation they had allegedly experienced. They also charged that inspite of Police personnel being present they were just mute spectators to the goings on instead of taking action. As a result many boys became brazen and molested and touched them inappropriately. One woman claimed that foreign tourists who had come to see the fest were also not spared. The Police had made elaborate security arrangements for the Open Street Festival organised by the District Administration. However, the number of people was more than anticipated. In a change of stance, the Police Commissioner who had stated that only four women had tweeted about molestation suggesting it was not a major issue, has today said the Police is viewing these complaints very seriously. The Commissioner also said that if anyone comes forward to lodge a complaint it will be registered. In a press release, the Commissioner said that not a single complaint was registered on that day either with the Police Officers present or at the Police Help Desk at the venue of the festival or in the Police Stations regarding the molestation and other charges. He also added that after they heard about cases of molestation the Police looked into over 100 video footages and found no such incidents. Meanwhile, when some of the women were asked why they were not registering complaints, as the Police can act only if there are complaints lodged, they said that they were not sure where to lodge the complaints and also were sceptical Police would act effectively. The Commissioner said that they were prepared for the event by deploying various types of CCTV cameras, drones and even setting up a Mobile Command Centre. Apart from this they had deployed 375 Police personnel and three Assistant Commissioner’s of Police, nine Police Inspectors, five Sub Inspectors, 19 Assistant Police Sub-Inspectors, 109 Head Constables and Constables, 36 women Police and 20 Home Guards. There were also three platoons of Karnataka State Reserve Police and one City Armed Reserve platoon. More importantly they were also 40 Policemen from the City Crime Branch in plain clothes. Many women alleged that the Police and the Organisers made strategic mistakes while hosting the Open Street Fest. First they said that the lights did not come even after it was dark giving perverts the much needed cover of darkness to carry out their dark acts. Secondly, they said that the Police should have blocked the entry of people to the Street Fest at 8 pm itself as the Yuva Dasara was starting nearby. Thirdly, the Police did not shut down shops and so people continued to throng the venue. And to add to the confusion, the Police in order to signal that the fest was over, turned off the lights which made it even worse. Finally, they said Police personnel were not easily visible or accessible for the victims to approach. Why Street Fest on Yuva Dasara and near it? 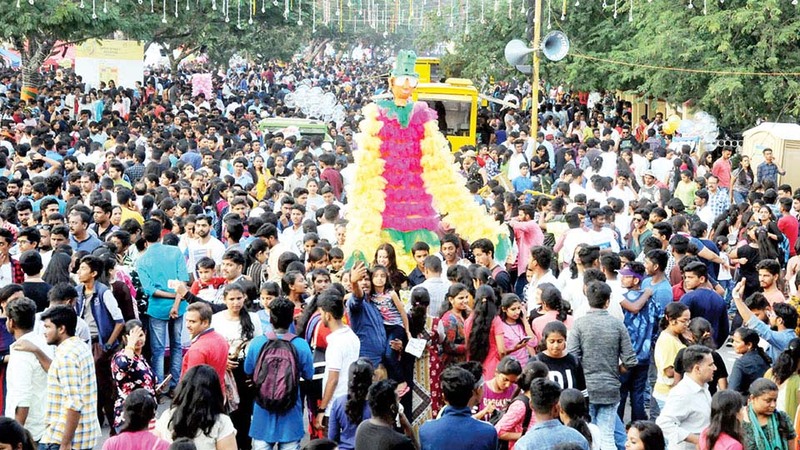 Many asked, if Police cannot handle a Street Fest why have it on the same day as the Yuva Dasara and also why on the road that leads to Maharaja’s Grounds where Yuva Dasara is held? What a rich cultural heritage!! Immature crowd. Wish the previous DC had some sense not to force this fest on our city. Hope this is never conducted ever again. Definitely brings bad name to the city. Absolutely ridiculous, an unwanted item in the Dasara agenda! It is well known that visitors intending to visit India-not that many from abroad, are warned in their own countries not to do so, as every city in India has many reported incidences of women molestation. It is not only the rogues, but also even ordinary people join to harass women- many episodes point to this. Indians bleat about their ancient rich culture, but the reality is different. In the previous generation too, such instances were common-for example, in late 1950s Jambu savari events, women-related harassment was so common in crowds that many young women stayed away from such instances. We witnessed this then; the difference was that the police were a bit more proactive then. The harassment instances these days seem to have gone out of control. In a Democracy every one has rights . So, you exercise your rights to molest a woman? You should be ashamed holding this view. Typical Indian culture indeed! !